Apple cider vinegar acts as a mild antiseptic but also has numerous other health benefits and contains vitamins and minerals essential for good health. It is particularly good for birds that are stressed or suffering respiratory problems but can be used as a general pick-me-up when they are feeling a bit under the weather. 20ml per litre can be added to drinking water in plastic drinkers only as it may cause galvanised drinkers to rust. Dispense as required or, for general maintenance, give for one week out of the month. Any more than this and despite the unpleasantness of the taste, and its acidity, internal parasites, worms in particular, can become immune to it. The apple cider vinegar used must be the full strength variety from equine or poultry stores. Health shops sell it too but it will be very expensive to buy from these outlets. Pasteurised apple cider vinegar, the type that can be bought from supermarkets, is no good for this purpose. 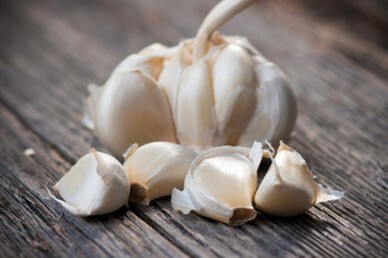 Garlic is another natural antibiotic and can be given either whole, chopped up or crushed and added to their water. One clove is enough for a small sized drinker, two or three for the larger sized ones. It is an excellent healer and an all round preventative additive which you can also alternate one week garlic, next week apple cider vinegar. Alternating in this way ensures your eggs do not become tainted. If you prefer, garlic granules can be added to their feed or treats once or twice a week. NOTE: The ratio of apple cider vinegar should be reduced for chicks and young birds to 5ml and 10ml per litre respectively. 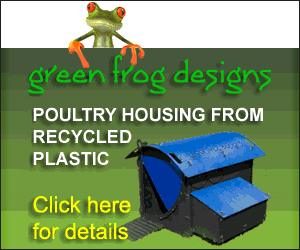 You should also reduce the dosage of garlic proportionally for younger birds. Garlic should be fine but you should not put Apple Cider Vinegar in a metal waterer.